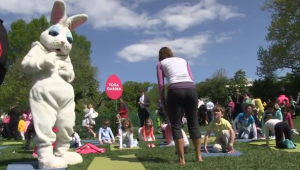 The White House Easter Egg Roll is a much loved tradition going back to 1878! 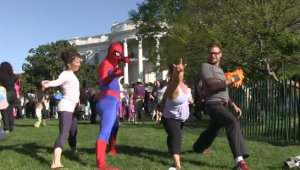 Thousands of families from every state gather at the White House to hunt for Easter eggs, play games, and have fun. For the last 4 Easters yoga has been part of the activities schedule, and this year yoga music artist MC Yogi joined in on the fun! Not just a musician, MC Yogi, his wife Amanda, and many other wonderful yoga teachers took part in the festivities. 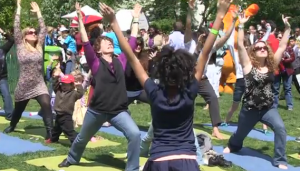 Teaching in 20 minute segments, MC Yogi and the other teachers were part of the “Yoga Garden.” There, kids and their families experienced yoga poses and games to encourage them to stay active. Even the Easter Bunny got in on the action!